The antipasti menu at TusCA. 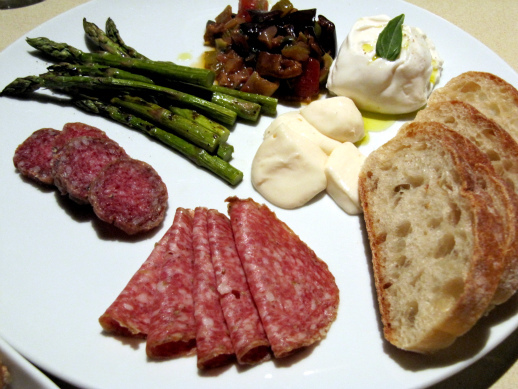 Choose 1, 3, 5 or 7 items from the selection of the finest imported and TusCA-made Italian cheeses, meats, and vegetables. Served with a dazzling array of condiments. 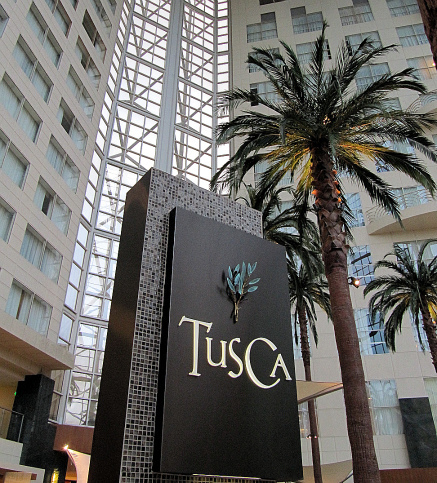 The best of Tuscany and California can be savored at TusCA, the signature restaurant of the Hyatt Orange County. Specializing in the hearty cuisine of Italy’s Tuscany region with an emphasis on seasonal and locally sourced ingredients, including herbs and produce from their own rooftop garden; farm to table is realized amidst the palm trees of the soaring 17-story atrium lobby. When Anita (Mad Hungry Woman) and I dined at TusCA last week, Chef Laura DeMartin offered her personal attention and graciously described each of the dishes we ordered and details of the new Spring menu items which will make their appearance in April. We’re already anticipating another visit to try the wild boar that will replace the Pappardelle with Short Ribs Bolognese! Check in with Mad Hungry Woman for her upcoming review. Sounds like a great bit of food with some nice wine to make the perfect meal. I have to admit…when the antipasti are good, sometimes I just fill myself up with them and forget about the rest of the dinenr 🙂 seems like TusCA really has a great selection! @Sara – You would know! And, yes, they have a terrific selection – I believe the Finocchiona was made in-house, too. A nice selection to obsess over this week! Oh a lovely plate of goodness, thank you for sharing TusCA with us.. This looks like the perfect selection of finger foods! Add a glass (or 2) of wine and its the perfect night! I love antipasti, this would be my kind of restaurant! Wow, what a great antipasti! I always love getting those at restaurants but none have ever looked as good as that! 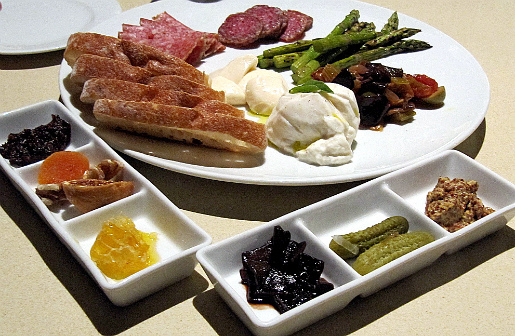 I love the presentation of the antipasti dish. It kind of looks like a bento box! By the way, I nominated your blog for an award. Stop by and check it out when you have a chance! Now, not only can I look forward to a visit in California…I can also add to that the anticipation of presenting myself at Tosca. Have a great weekend Priscilla. @FOODESSA Coconuts are actually the fruit/seed of the coconut palm. Coconuts sold in the US. are either brown, white or tender. Tender refers to young, immature coconuts that are shaped to look like large pencil tips and used for their water – the meat is gelatinous vs, the white meat of a mature coconut. I can’t help but just fall in love with that eggplant ravioli! Looks super! What a great selection of food! I could be quite happy with the eggplant ravioli. It looks like a perfect lighter meal. seemed like you had a very good delicious time there! i’m okay with antipasti but the eggplant ravioli sounds wonderful! I miss the sunshine in CA! This would be my obsession too!! The eggplant ravioli looks outstanding! Love the tomatoes and ricotta. 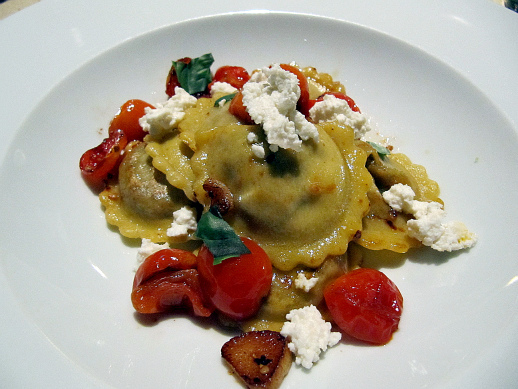 Love the eggplant ravioli, just delightful…and I adore TusCA. Now I see all of our foodie lovers here wanting to visit 🙂 Lovely review!